Roads and bridges are collapsed. The power grid and telecommunications infrastructure are also seriously affected. Measuring 7. 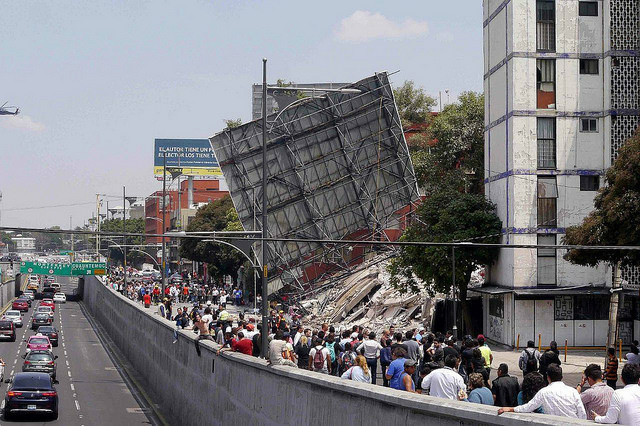 1 on the Richter scale, a second earthquake in less than two weeks hit Mexico on 19 September severely affecting the populations of the states of Morelos, Tlaxcala, Puebla, Guerrero, Oaxaca, and Mexico City in central Mexico. As of 01:00 AM (local time in Mexico) 248 deaths were reported. Many more are buried under the debris of destroyed buildings. Roads and bridges are collapsed. The power grid and telecommunications infrastructure are also seriously affected. Caritas Mexico in coordination with Church groups and agencies, is establishing a monitoring network with the participation of bishops, vicariates and clerics to support the response effort. The Mexican Episcopal Conference said that they are looking at how best to coordinate to help more. Churches in Atlixco, Cholula, Amozoc and Ciudad de San Sebastian have suffered damages. The bell towers of the Cathedral of the Diocese of Tenancingo have also undergone serious damage. The Archdiocese of Puebla as others, calls for calm and solidarity among its parishioners while awaiting the instructions of the authorities.